The United States Patent and Trademark Office handles trademark applications, while copyright applications should be submitted to the United States Copyright Office. Trademark protection can continue indefinitely, as long as registration is renewed in accordance with the guidelines set forth in federal law. However, copyright protection has a limited duration. 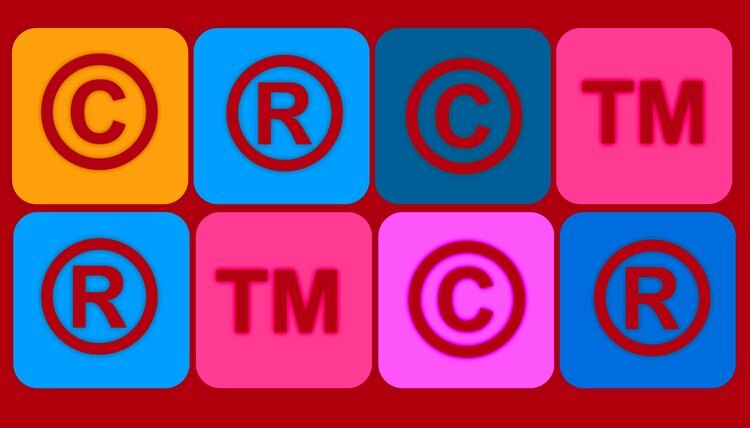 Trademark and copyright protections are not the same -- they serve different purposes. To properly protect your creation, you first need to determine which method to use. The USPTO will accept applications from individuals or companies seeking to register an image, logo or slogan identifying a product or company in commerce. On the other hand, copyright protection is available for an author's original work that is fixed in tangible form. Copyrightable works fall into eight categories including literary, dramatic, architectural, musical and pictorial. A trademark can last indefinitely, so long as it is renewed in accordance with Sections 8 and 9 of the Trademark Act and remains in continuous use. After initial trademark registration, the trademark is valid for six years. If the mark, logo, image or slogan will be used in commerce for a longer period, the trademark holder must file a Section 8 Declaration of Use form to renew the registration. This form attests that the trademark is in use in commerce and must be submitted to the USPTO within the fifth and sixth years of initial registration to continue trademark protection, though there is a six-month grace period. The next renewal must occur during the ninth and 10th years after initial registration. This time, the Section 8 Declaration of Use must be submitted with a Section 9 renewal application. From this point on, trademark protection continues as long as the Declaration and renewal application are filed every 10 years. Timely submission of these documents and payment of fees is required to ensure continuous trademark protection. Failure to do so means cancellation of the trademark registration. It cannot be reinstated, and an entirely new application must be filed. Unlike trademark protection, copyright protection has a limited duration. The duration of a copyright is based on when the work was created. There are two categories -- works created on or before January 1, 1978 and works created after January 1, 1978. For pre-1978 works, the initial term was 28 years. The Copyright Act of 1976 permitted an additional 47 years upon renewal, extending copyright protection to 75 years from the date of issuance. In 1998, the renewal term was raised to 67 years, so for all existing copyrights from before 1978, the total duration of copyright protection is 95 years from the date the copyright was issued. A 1992 amendment to the copyright law makes all copyright renewals automatic. For works created after January 1, 1978, a copyright is valid throughout the creator's lifetime. After the creator's death, the protection continues for a term of 70 years. If the copyrighted work was a joint work with two or more creators, the copyright term expires 70 years after the death of the last surviving creator. And if a work was created anonymously, under a pseudonym or was a work for hire in which the creator is not the copyright holder, copyright protection lasts 120 years from the date the work was created or 95 years from the date it was published, whichever period is shorter. Trademarks protect distinctive brand words, phrases, symbols or designs from unauthorized use by others. Trademark rights exist as soon as you start using your trademark in commerce and the rights become stronger with continued use. To obtain proof of your rights and maximum possible protection, you should register your trademark with the United States Patent and Trademark Office, or USPTO.